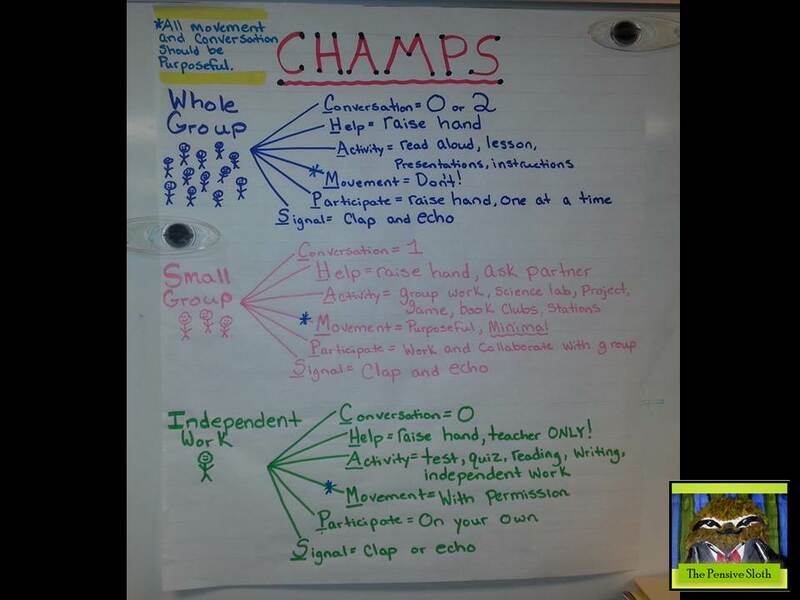 CHAMPS anchor chart sets classroom expectations for students in whole group, small group, and independent settings. Spring break has been fantastic, but it is winding to a close and school will start up again on Monday. There is always a transition period for students as they return from a long break and get back in the swing of things at school. We will certainly take some time Monday morning to review our classroom expectations to set students up for success. Let me tell you a little about CHAMPS. C is for Conversation–What voice level should students be using during each setting? H is for Help–How will students get help if they have questions? Raising hands, asking partners? A is for Activity–What is the activity expectation, for example are students taking a test or working in a small group on a science lab? M is for Movement–Are students allowed to get up, sharpen pencils, etc. or should they stay seated? P is for Participation–What are the expectations for participation? Should students be commenting one at a time, collaborating with their group, on their own? S is for Signal–How will the teacher signal that she needs the group’s attention? Clapping, counting to 3, having students echo, etc. The big ones for my kiddos are movement and conversation. You can see in the chart that I have starred movement and added that it should be purposeful, meaning that we don’t need to get up and sharpen each map pencil one at a time or walk around the room to get to a tissue box that was within reach. We are still working on this one! What I love about CHAMPS is that it is easy to set up and communicate with students. Yes there are still rules, rewards, and consequences, but CHAMPS minimizes the need for extensive systems to manage classroom behavior. I love it! NOTE: There are a few variations on this and you have to find what works for your kiddos! I believe the CHAMPS idea originally came form Safe and Civil Schools and is part of PBS (positive behavior support). I’m no expert on this, but a little Gooogling will get you more info. Feel free to comment below if you have questions or would like to share how your classroom systems are set up!